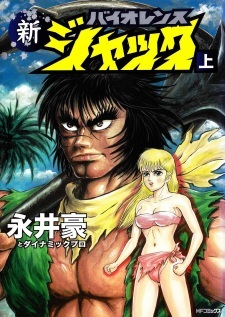 This brief resurrection of Go Nagai's Violence Jack character appeared in 8 chapters in the magazine Comic Bunch in 2005 and has never been collected in a single volume. OK, resurrection may be the wrong word since Jack didn't actually die when Nagai ended the original series in 1990 and he also didn't bite it in the 2001 stand-alone short story DEMONS IN A WAR-TORN land. But you get the idea. As a new fan to Go Nagai, Shin Violence Jack is the series for those who already read Devilman & heard of the Violence Jack connection. The best way to describe this manga is a Devilman Violence Jack Crossover with demons such as Jinmen & Sirene making appearances. Sadly, Devilman only has a very brief tease. This manga definitely feels like a dark fantasy epic serving to satisfy those who wish to see the "Devilman stories" in the Violence Jack manga. While it doesn't offer the "true ending" to the Devilman Vs Satan tale it certainly makes you wish this story was longer. Some of the chapters online seem to be missing but everything that is dark fantasy & Devilman related is intact & possibly complete as the ending seems to be open ended. Shin Violence Jack is a definite read for fans of Devilman & Violence Jack.